p.m. on May 4, 2018, at Alhambra Care Center in Alhambra, Illinois. Mrs. Noll was born on January 29, 1923, to William J. and Mathilda A. (Korte) Alberternst in St. Rose, Illinois. At the age of 14 she went to work as a nurse’s aide at St. Joseph Hospital in Highland, Illinois. She was employed in several jobs in Highland and then Denver, Colorado. On May 5, 1945, she married Vernon L. Noll in Denver when he returned from active duty in Europe with the United States Army Air Corps. Soon after, they made their home in Edwardsville. elementary school, she was active in the St. Boniface School PTA and the school’s band parents association. 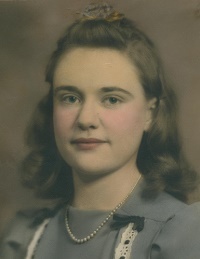 In later years she worked in sales at several women’s clothing stores in Edwardsville, including Auerbach’s and Blume’s. She loved reading, staying up-to-date on the news and politics, and working crossword puzzles. Carlinville, Illinois, Jeffrey Noll and wife Tami, Edwardsville, Janie Denzel and husband Robert, Olathe, Kansas, and Kevin Noll and wife Gayle, Ballwin, Missouri; grandchildren Ali Denzel, Nick Noll, and Alex Noll; stepgrandchildren Kellen Kolesar, Benld, Illinois, and Holly Yotter, Edwardsville; sister Josephine Gutzler, Highland; sister-in-law Anna Alberternst, St. Rose; and many nieces and nephews. Vernon Noll; her beloved son, Michael Jay Noll, who died at age 15; granddaughter Kaylee Noll; son-in-law Roger Zimmerman; and daughter-in-law Elizabeth Noll. William Alberternst, James Alberternst, Mary Edith Loeh, and Daniel Alberternst; brothers-in-law Wayne Gutzler, Conrad Stone, Frank Seitz, Bob Lang, Larry Oder, and Alan Loeh; and sister-in-law Pat Alberternst. Edwardsville, and after she and her husband moved to Glen Carbon, St. Cecilia Church. A private funeral service will be held, with burial at St. Boniface Cemetery. Memorials may be given to St. Boniface and St. Cecilia churches and the St. Boniface Cemetery Association. Saksa – Mateer Funeral Home in Edwardsville is in charge of arrangements.